Well, the season is really off at a charge. It's quite mad actually. I have struggled to find five minutes to offer an update to this blog. Once the supermarkets had fired the starting pistol, offering tender,flowering bedding in the first week of April, there was no stopping the rush. My father would watch the sky for the tell tale sign of frost,every evening until the end of May. Many were the nights of covering plants after dark. Caution it seems has been thrown to the wind. It would be hypocritical to say that I am not selling, I just hope that plant buyers understand the responsibility and the watchful care that is required. How desperately we need the rain too, it will be long old season if we don't get a splash soon. The Cheltenham Festival wasn't the only thing kicking off last week. A few hours of sunshine and the gardeners were out in their droves. We have all been desperate to get out there and suddenly there was a window of opportunity. Nature still managed a bit of mischief making and after dark on friday we were treated to four degrees of frost, but it didn't deter many. The seeds were flying out, the first potatoes were going in and we had put out a range of young vegetable plants to liven the display. It is still early days,but there is a feeling that the season has arrived and with the clocks set to change this weekend spring just has to be close. As the nights retreat and the Forsythia buds pop to brighten the scene, I can sense the imminence of spring. It has been a tough journey through winter, but there is real hope now, the clocks will change within weeks and we will be in full swing. It has been very difficult to find the motivation for a committed run at the garden, with so many grey days jostling to fill the month, but it has been the hard physical stuff that has been most satisfying, not least because it offers purposeful distraction. So, against all the odds I have been digging and whilst the ground is still heavy, the air rush across the newly turned land is drying and warming. I have also found great joy in rebuilding my compost heap, firstly skimming off the recent material and then plundering the rich compost beneath. Composting is hugely satisfying and I am always amazed by the speed with which it all happens. My bin is a simple construction, formed by the squaring of four old pallets to create a box. I just peel them away from the heap and pop them back together once the good compost is removed. I will be glad of the space too with so much clearing up to do. I have started a bit of pruning now, with the sap on the move growth will soon be restored. As predicted there are some winter losses, but I am still going to give my apparent casualties another month, just in case they still have a trace of life. My few bits of sowing on the window sill last month have come good and I have some cabbage which will be fit to plant out in a fortnight. The lettuce isn’t far off either, though I will try to offer it a bit of protection, when I plant it, the weather is still spiteful. Even a bit of fleece for a week will soften the growth and keep it edible. I will probably harvest it young anyway. The seed of salad stuff is so cheap that as long as sowing is repeated regularly, there is no need to strive for maturity. By the middle of the month, I will be hoping to really be underway with my sowing anyway. At the end of the month I will be sowing Tomatoes. I do yearn for the return of home grown tomatoes, though I did manage to keep fruit ripening right up to Christmas. And finally, watch out for a gnome revival. Last month saw the release of another amazing animated feature film, ‘Gnomeo and Juliet’ a cartoon based on the Shakespearean classic . The strong gnome cast are bound to be seized upon by the merchandise boys and I will be amazed if we don’t see them everywhere. On thursday afternoon,I tucked in to some serious tidying up around the site. The sun was warm and I worked on through the afternoon in shirt sleeves. I saw hope in the emerging buds. The Raspberry canes and Currants were all showing signs of life and I put out a few broad bean plants. It was all very exciting. But,that was thursday and today cold rain sweeps the land to cussedly supress the rising optimism. I am amazed at the number of customers today. I think that when the weather does improve,we will hear the sound of a starting pistol,followed by the thunder of a million wellington booted gardeners desperate to catch up. With every passing lengthening day we and the clocks prepare for spring. Hooray ! There goes another Valentines Day.............and it has been quite a day. Romance is not dead after all and we have shunting flowers all over the district. Buying in is always a nervy job,especially when the celebration falls on a monday and every other supermarket,garage and corner shop has a rack of flowers. It didn't distract our customers thankfully though and our displays were quite depleted by the close of day. The shelves will be restocked tomorrow*. 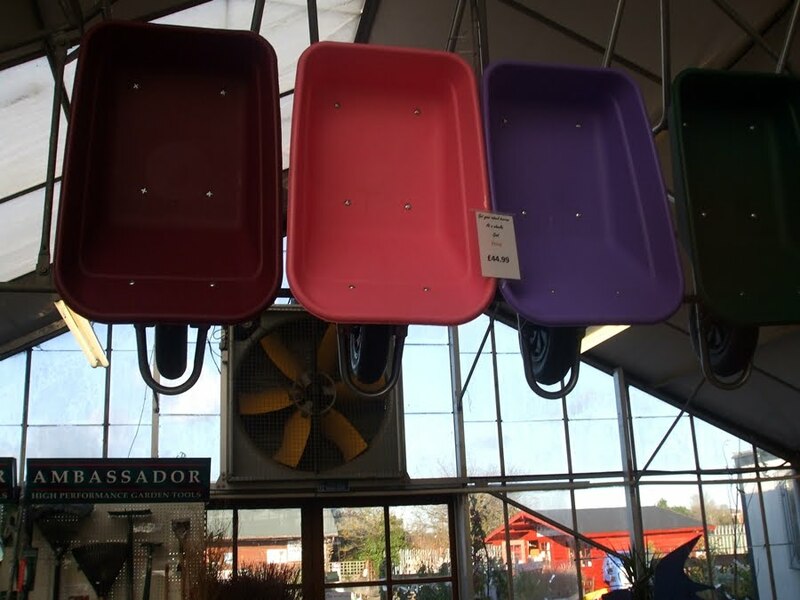 Potato sales also continue to be strong, but gardeners do need to take care with storage, I have seen a very frosted tray of seed today. The customer had just set them out in a cold greenhouse and clearly they hadn't enjoyed the stay. The frost damage will take a week or so to show. With the forecast still suggesting cold,do keep watchful and cover them if the threat becomes real. For those watching and waiting,we have our final consignment of potatoes due on wednesday. It has been a blustery old day again, but it hasn't put off the potato customers,or indeed those, who like me are chomping at the bit just to be getting out there. The wind is at least drying the top and I am not taking quite so much mud back to the house. We are seeing sales across all areas of the shop and the demand for seed suggests the spring can't be too far away. I have sown a few bits in the hope of a warmer end to the month. Not far off either is Valentines day and our florist is already seeing increased ordering. We have a heavy goods week ahead, with the bulk of our new compost and dare I say 'more' potatoes due. I will be trying to update the Taterbase availability later. What a mish mash of a month January has been, but the evenings do seem to be drawing out and there is comfort in knowing that spring will soon be upon us. The bulbs are nudging through, with the crocus and snowdrops already showing colour and even the daffs seem to be on their way. I was expecting heavy losses in my autumn sowings, with the ground having been so cold, and there are some screaming gaps in the peas and broad beans. One area is a decimated patchwork of rotted and robbed. I am going to fill the spaces with some more seed I think. In one row I look to have lost about half of them. I will still use the Aquadulce bean seed that I have kicking around. They are so much more robust for cold sowing. I am starting a few bits of veg seed on the window sill in pots too. I had planned big things for January, but struggled to find the enthusiasm (I only seemed to find time on the greyest days.) So a pinch of lettuce and a bit of cabbage in little pots for starters and then I will prick them out in a fortnight into a tray. It will give me about thirty plants and they will be ready for the ground by mid-March. I have managed to loosen a bit of ground for some onions and shallots and will hope to get them out in the next day or so. I was reminded over christmas of just how good shallots are. I had them roasted and pickled, and they are rather special. Home raised and home pickled onions are positively addictive too, so the space is dedicated. I have also been snatching a few spuds up. I am going to have another play with the early variety Volumia in some big pots. They were fantastic last year. I was offered them as early and suitable for baking (an unusual combination, the later varieties normally being better suited.) They were true to the promise and more. I am sticking them straight into pots, but will push them down well and will probably stand them inside if the weather turns bleak. I am not expecting to see much life for a month anyway. It is a bit of fun and not costly, if I lose them, I will just swap in some more. And finally, as expected the winter has once again been very hard on the garden as a whole, with many shrubs and trees taking a real beating. 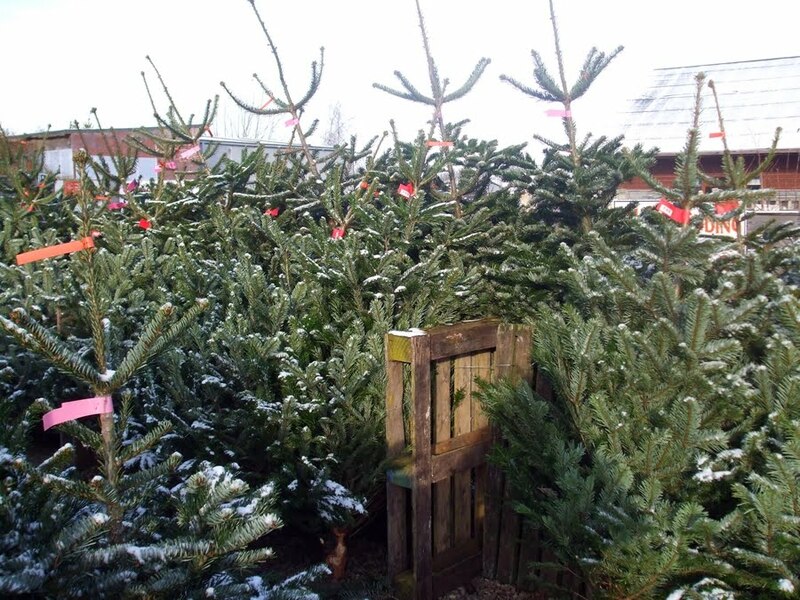 Don't be hasty in digging things out and stall any cutting back until mid-March. Last year many things were dug up and condemned prematurely. What a crazy few days we have had. There have been lorries everywhere, laden with stock to ensure that we are set for the Potato Festival. We have had Onion sets,shallots,garlic,rhubarb,loose peas and beans,chemicals,compost and of course more potatoes. It has all been good humoured too, well at least until Stephen started playing hide and seek. Clearly James was not impressed. Much to the joy of all on the site, our organic and Dutch potatoes all turned up this week and so we are on course for the big Potato Weekend. The dutch stock turned up in the dark as we were about to close and the driver was not terribly impressed by our lack of forklift. He was though clearly overjoyed at the fact that it took us just 20 minutes to offload 3 tonnes and send him on his way. The celebration of the arrival was heard across the land and today we were joined by the press keen to support our promotion. After days of sweating over the silence from Scotland and the nightmare of starting 2011 with not a potato on the site,our suppliers pulled out the stops at the first hint of a thaw. The first of the new seasons seed arrived three days after Christmas. The off loading of 300 bags on the first day back the perfect antedote to the 'Christmas stuffing', even Simon our youngest team memeber was impressed. LOOSING THE PLOT........beneath the snow. HO ! HO ! HO! SANTA IS VERY EXCITED,IT APPEARS THAT EVERYTHING THAT HE WANTED FOR CHRISTMAS ARRIVED THIS YEAR. HE'S EVEN PLANNED THE BED.......... THE QUESTION IS WHO DELIVERED HIS PRESENT ? We know who is delivering ours,we just need the temperature to lift enough to get them out of Scotland. I am going to sow a few Kelsae onions tomorrow and then settle down with glass of whiskey and a good seed catalogue. WE ARE FLOATING IN THE AIR ? The weather outside may have been frightful,but it does not seen to have deterred the 'tree folk' and trade has been quite boisterous. I would love to plant a microphone in amongst the Christmas trees. I could capture some wonderful commentary as families air their differences over the shapes and sizes. One family spent well over an hour selecting.Having experienced a Christmas with a twig, I have already bagged a 'big un' and hidden it. I am just hoping to avoid domestic repercussion. There has also been good interest in the last minute gift items too and particularly in our collection of retro pink (well,that's what the packet said) accessories. 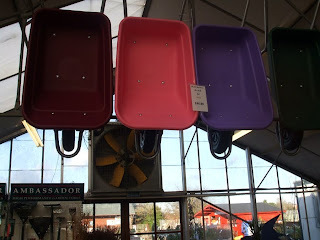 The wheelbarrows in particular,are amazing and are also offered in burgundy and purple. Here we are in the second week of the freeze, the days dominated by Christmas tree wrapping and repairs. I am amazed at the early interest in trees. Its probably all down to the resolved needle drop issue. We are in the process of cleaning up around the site and the troops today have been engaged in 'bench painting' .............what a pity that radio volume doesn't have an impact on paint drying, the benches could have been back out by lunch time. The slightly frustrating thing about this chill,has been the collapse of soft fruit and bare root hedging sales. We have it all bundled up ready to go,but frankly you need a pneumatic drill to get the things into the ground. How quickly the days have raced away,in just six months moving from Chilli to very,very chilly and Christmas knocking at the door. It has been an amazing Autumn, with the best colour in years, but it all is forgotten with the cutting swipe of an east wind and the arrival of Christmas trees and Poinsettias. We hold back to the last with our celebrations,trading only in the festive perishables (avoiding the tinsel and trinkets trade).All the signs are good for a lively run in. Particularly pleasing is the early interest in flowers for Christmas. We have taken quite a few early telephone orders too and will be delivering into the darkness on Christmas Eve I suspect. 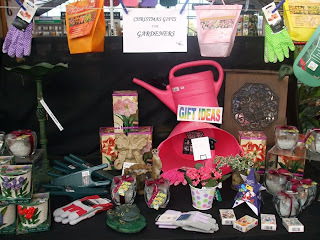 is a family run Garden Centre on the outskirts of Cheltenham, Gloucestershire. We have been trading since 1947, so we have a few years experience! 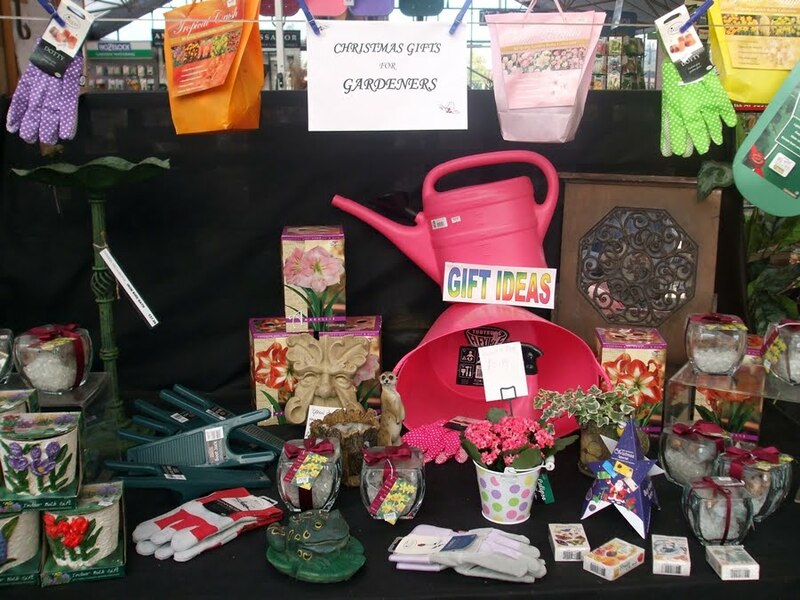 We grow our own bedding and vegetable plants on site and stock an extensive range of shrubs, trees, pots, stoneware and sundry items. We are known nationally for having one of the largest ranges of seed potatoes. We also have a florist department, pet shop, craft shop and tea room! What more could you want?! We have friendly, knowledgable staff who are here to help you. We look forward to seeing you soon!